‒ look for improvement opportunities constantly. 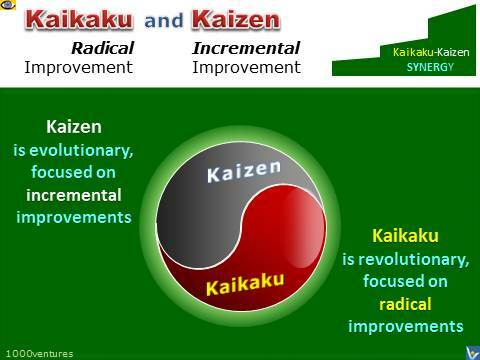 Kaikaku is a lean production term that means radical change, transformation, a revolution. Kaikaku is sought in addition to Kaizen, not in place of Kaizen. Hiroyuki Hirano's The 10 Kaikaku Commandments are all good basic principles to start any improvement journey. ① Throw out the traditional concept of manufacturing methods. ② Think about how the new method will work, not how it won't work. ⑥ Correct mistakes the moment they are found. ⑦ Don't seek perfection; a 50% implementation rate is fine as long as it's done on the spot. ⑧ Don't spend money on Kaikaku. ⑨ → Ten persons' ideas are better than one person's knowledge. "Problems give you a chance to use your brains."